In sum, the world is facing the most serious nuclear threats since the first half of the 1980’s. At that time President Ronald Reagan said, “a nuclear war cannot be won and must not be fought” and called for the complete elimination of nuclear weapons. At stake are real accountability for Laboratory management and, potentially, over $272 million for violations of the Resource Conservation and Recovery Act (RCRA). WASHINGTON — The National Nuclear Security Administration will receive an 8.3 percent increase over its current budget, with an eye on completing production of a new low-yield nuclear missile this upcoming fiscal year. 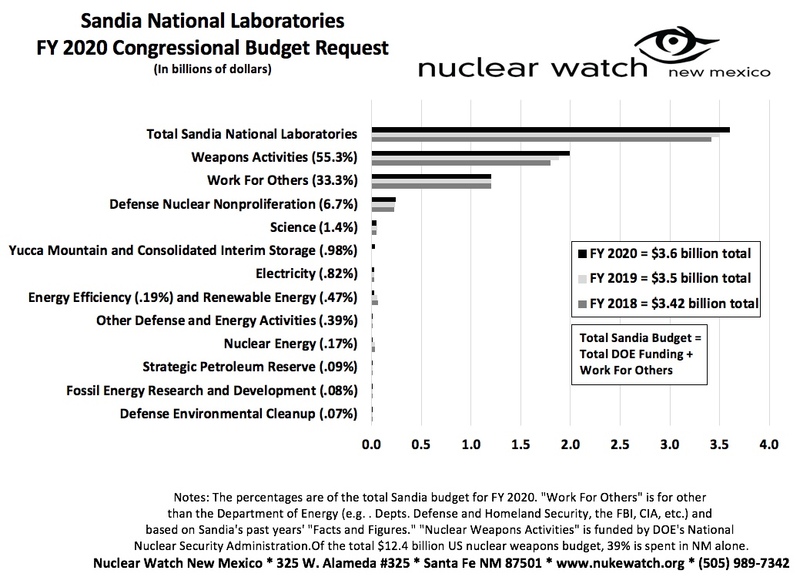 The NNSA, a semiautonomous agency within the Department of Energy that has oversight on America’s nuclear weapons stockpile, is requiring $16.5 billion in the fiscal 2020 budget, up $1.3 billion from its FY19 total. Weapons-related activities would see an allocation of $12.4 billion, an 11.8 percent increase over how much funding went to that mission in FY19. 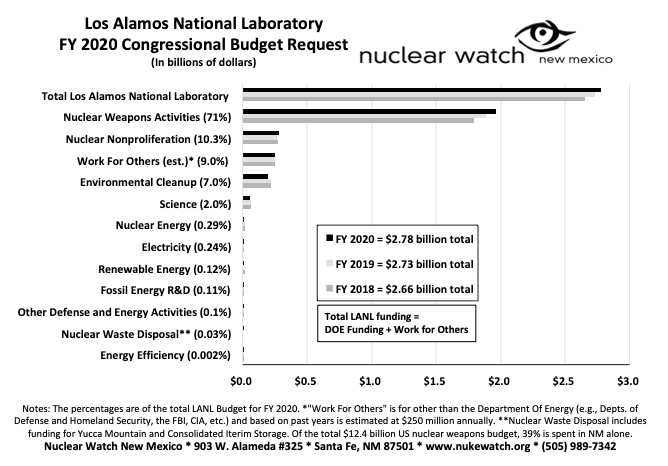 NNSA’s proposed budget comprises 52 percent of the DOE’s total budget request. A federal investigation into operations at the Waste Isolation Pilot Plant near Carlsbad was announced last month, after workers in the underground and on the surface were allegedly exposed to dangerous chemical and excessive heat. The U.S. Department of Energy’s Office of Enterprise Assessments’ Office of Enforcement announced the investigation on Jan. 29 in a letter to Bruce Covert, president and project manager of Nuclear Waste Partnership – the DOE-hired contractor that oversees daily operations at WIPP. "NukeWatch is very concerned over the possible termination of the JASONs. In 2004 NukeWatch asked then-Sen. Jeff Bingaman to require a JASONs study on the reliable lifetimes of plutonium pits, the cores of nuclear weapons. At the time the govt claimed pits were reliable for 45 years. The JASONs' conclusion that pits last 85 years or more had a profound effect, leading to congressional rejection of new nuclear weapons designs and related expanded pit production." The Jasons, as they’re sometimes called, are a team of academics who have historically tackled some of the most pressing scientific problems on behalf of the U.S. military. News that the Jason contract had been terminated was first revealed yesterday during a House budget meeting with members of the National Nuclear Security Administration (NNSA) and reported by Science magazine. The U.S. must re-engage with Russia to ensure the ultimate weapon doesn’t spread and is never used. The U.S., its allies and Russia are caught in a dangerous policy paralysis that could lead—most likely by mistake or miscalculation—to a military confrontation and potentially the use of nuclear weapons for the first time in nearly 74 years. A bold policy shift is needed to support a strategic re-engagement with Russia and walk back from this perilous precipice. Otherwise, our nations may soon be entrenched in a nuclear standoff more precarious, disorienting and economically costly than the Cold War. The most difficult task facing the U.S. is also the most important—to refocus on America’s most vital interests even as we respond firmly to Russia’s aggressions. Thirty-five miles out of Carlsbad, in the pancake-flat desert of southeast New Mexico, there’s a patch of scrub-covered dirt that may offer a fix — albeit temporarily — to one of the nation’s most vexing and expensive environmental problems: What to do with our nuclear waste? Despite more than 50 years of searching and billions of dollars spent, the federal government still hasn’t been able to identify a permanent repository for nuclear material. No state seems to want it. In 2017 Team Trump worked to clinch a nuclear deal with Saudi Arabia—and an independent investigative agency wants to know what happened behind closed doors. One of the government’s top investigative agencies has looked at allegations of potential wrongdoing by individuals in the Trump administration about their planning of a nuclear deal with Saudi Arabia, according to two individuals with knowledge of the probe. The line of inquiry is part of a broader investigation in the Office of the Special Counsel—an independent federal investigative and prosecutorial agency—into alleged politically motivated personnel decisions at government offices. The OSC, which can seek corrective and disciplinary action, is looking at whether officials were retaliated against for raising concerns about the administration’s work related to a Saudi nuclear deal. As part of that investigation, OSC has also reviewed allegations about potentially improper dealings by senior members of the Trump administration in their attempt to map out a nuclear deal with Riyadh, according to two sources with knowledge of OSC’s work. The details of the OSC probe, previously unreported, are the first indication that a government body other than Congress is investigating matters related to a potential nuclear deal between the U.S. and Saudi Arabia. OSC declined to comment on the record for this story. U.S. taxpayers are no strangers to getting saddled with monstrously expensive weapons programs at the expense of basic needs like food, shelter and education. The Pentagon paid $44 billion for 21 very fragile B-2 stealth bombers, few of which still fly in combat roles. The F-22 fighter, coming in at more than $350 million per plane, was built to combat Cold War adversaries who ceased to exist six years before the first jet rolled off the production line. The sticker price for Ronald Reagan’s harebrained “Star Wars” missile defense program stands at around $60 billion. Until we find a better way, we will continue to spiral ever downward to dissolution. Tonopah is a subsection of the Nellis Test and Training Range, which is jointly operated by the Department of Energy and Air Force. Since the early 1950s, the Nellis Range has been the site of extensive government aerospace and weapons testing. The Nellis Complex contains the drone pilot HQ Creech Air Force Base, the site of extensive nuclear detonations formerly known as the Nevada Proving Grounds, and what is colloquially referred to as Area 51. The F-117A Nighthawk stealth fighter, experimental unpersoned aerial vehicles, and, most recently, the delivery vehicle of the much-thunkpieced B61-12, a “steerable,” variable yield nuclear bomb, have been tested there. It is essential that we re-engage with Russia in areas of common fundamental interest to both nations, including reducing reliance on nuclear weapons, keeping them out of unstable hands, preventing their use and ultimately ending them as a threat to the world. – Mr. Shultz served as secretary of state, 1982-89. Mr. Perry served as defense secretary, 1994-97. Mr. Nunn, a Democrat, was a U.S. senator from Georgia, 1972-97, and was chairman of the Armed Services Committee. Ukrainians protest against the cover-up of the consequences of the Chernobyl accident, April 1990.